If you are looking to get more involved in your community, meet some other civic minded folks or just find out more about what these organizations do everyday, stop by the Union Project on Thursday night for Help or High Water II. 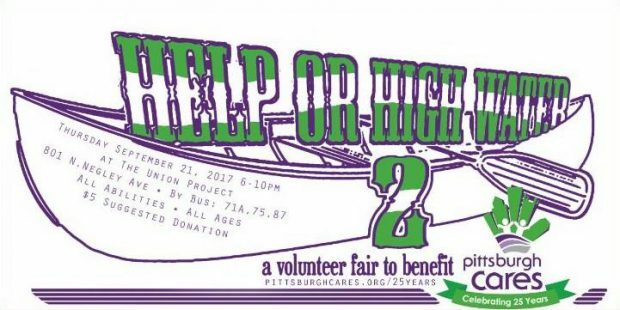 The first “Help or High Water” event in January was such a success — hundreds of volunteers, dozens of nonprofit agencies in attendance — that Pittsburgh Cares is organizing another to help us commemorate our 25th year of serving the Pittsburgh region. In other words, happy birthday to us! We’re celebrating with food trucks, beer from Full Pint Brewing, wine from J&D Cellars, Maggie’s Farm Rum, Red Star Kombucha, celebrity bartenders, and more. Bring your friends, bring your wallets (suggested $5 at the door), and bring your willingness to improve your community by supporting one (or more) of Pittsburgh’s many worthy charities and service agencies. While you’re here, get to know a bit more about the evening’s beneficiary, Pittsburgh Cares, which works to advance a culture of volunteerism and civic engagement in the region. Pittsburgh Cares matches non-profits with volunteers of all ages, and organizes one-time and recurring volunteer activities.